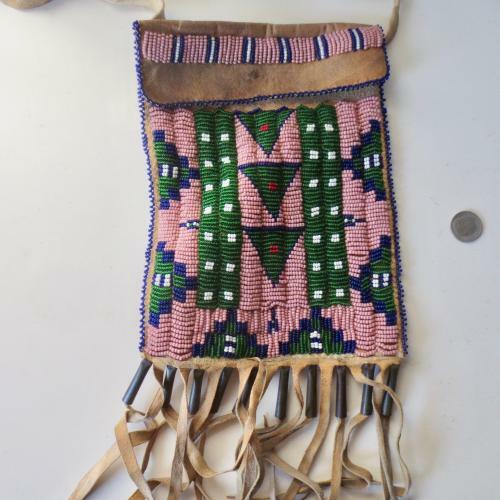 Some of the most beautifully decorated Native American items are bags: tipi bags, medicine bags, saddle bags, "possible" bags, tobacco bags, ration card bags and bags unnamed. Bags hold the necessities of life; food, shelter, medicine and they hold precious items. If you want to take something with you, you often put it in a bag. Very early bags were likely made of leather and/or animal hides. Many Indian bags still are. Bags made of leather added to turtle shells were used by many tribes. 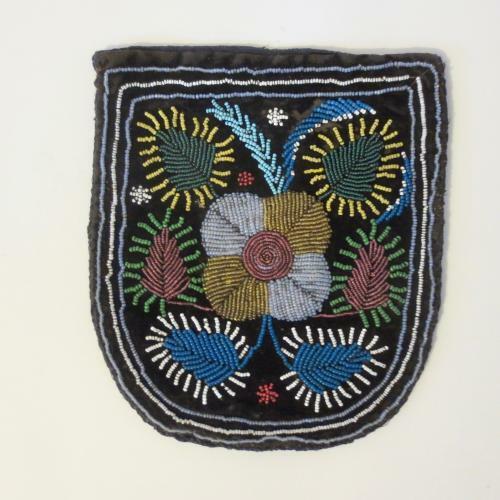 These early bags were decorated using porcupine quills, bird feather quills and mineral pigments. A parfleche is a Native American container made of rawhide - which is a hide or animal skin that has not been tanned but has had fur/hair removed. Parfleche bags are very tough and inflexible. Tanned leather makes softer bags that are easier to fill and carry. Post-European contact some of the tanned leather bags were decorated with trade beads made of glass. In more recent years bags made of fabric have been used and decorated with glass beads. 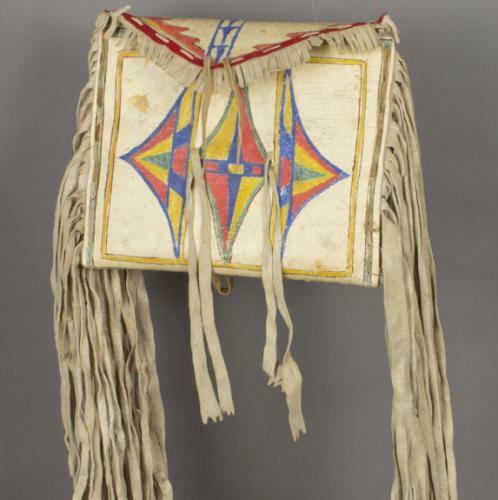 Native American bags were decorated with symbols and designs that were used and understood by the tribes that made them. 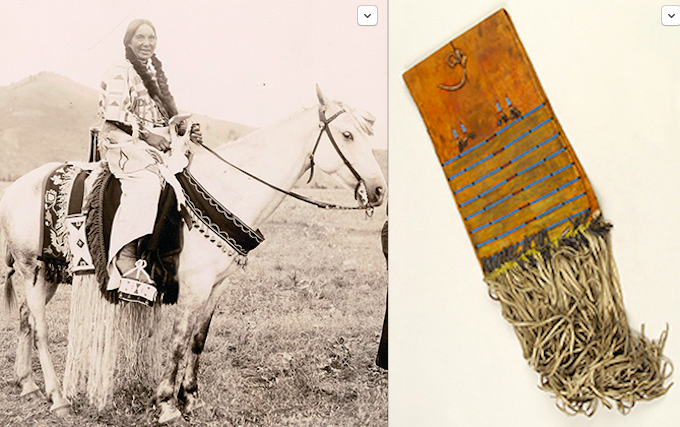 Native American bags were/are utilitarian, but are also often works of art. For carrying larger items, bandolier bags and other bags that went over the shoulder were used. Bandolier bags have large shoulder straps and have an opening at top with no closure, often heavily decorated. Other shoulder bags have a narrower strap, may have a top closure or a flap that covers the opening slit at top. 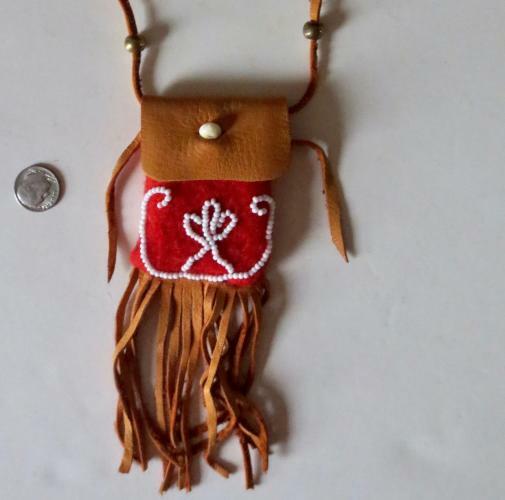 Medicine bags are worn around the neck or tied to a sash or belt. Each area of the country has medicinal plants, these are dried and/or ground and originally were placed at the center leather squares which then were drawn up around the medicine and tied securely with sinew or plant twine. Many types of rocks are/were thought to have healing or mystical powers and sometimes these were placed in a medicine bag with or without the plant medicine. In some areas of the country animals are thought to embody characteristics such as bravery or fertility. These animals combined with properties thought to be in minerals such as turquoise, jet, quartz etc by carving the specific animal from a specific rock/mineral. This makes a fetish - and in the southwest fetishes are particularly important medicine and a fetish animal or 2 (or more) are carried in medicine bags to imbue the wearer with those powers. Tobacco, strike a light, pipe and ration card bags were made in sizes for their purpose, to hold these items. These bags, while larger than medicine bags, were worn either around the neck or tied to the belt or sash. Later bags made by various tribes were used as trade items or were made to sell. 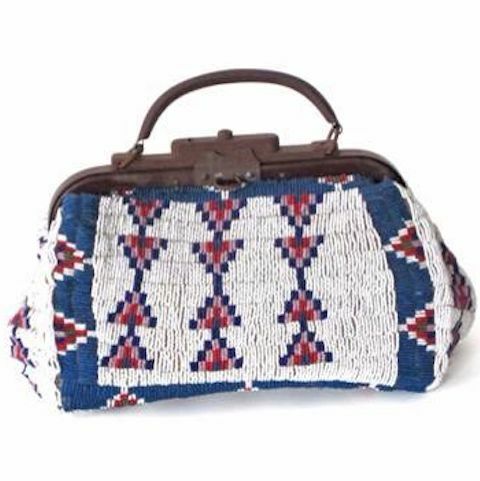 These include Plains Indian beaded doctor bags and woman's handbags - both complete with commercial metal closures at the top. The Northwestern tribes such as the Salish made large beaded bags with intricate scenes of realistic flowers, deer, elk, horses and mountains etc. 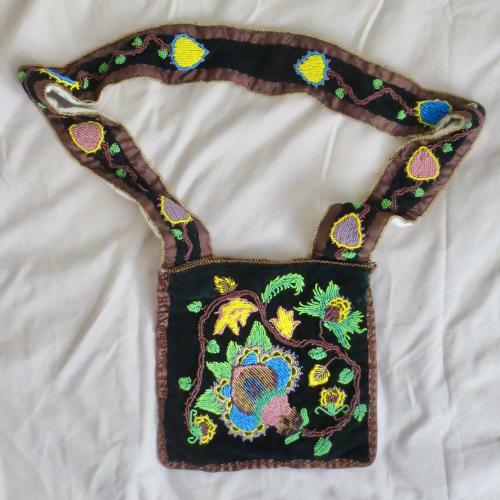 The Northeastern/Woodland tribes made ladies handbags of fabric in the current fashionable shapes of the times and added beadwork of their own floral design.